Can You Bake The Optimal Cake? Welcome to The Riddler. Every week, I offer up a problem related to the things we hold dear around here: math, logic and probability. These problems, puzzles and riddles come from many top-notch puzzle folks around the world — including you! You’ll find this week’s puzzle below. Mull it over on your commute, dissect it on your lunch break and argue about it with your friends and lovers. When you’re ready, submit your answer using the link below. I’ll reveal the solution next week, and a correct submission (chosen at random) will earn a shoutout in this column. Important small print: To be eligible, I need to receive your correct answer before 11:59 p.m. EDT on Sunday. Have a great weekend! Before we get to the new puzzle, let’s return to last week’s. Congratulations to 👏 Stephane Galzin 👏 of Montreal, our big winner. You can find a solution to the previous Riddler at the bottom of this post. Now here’s this week’s Riddler, a delicious birthday puzzle that comes to us from Jim Crimmins of Albuquerque, New Mexico. A mathematician who has a birthday coming up asks his students to make him a cake. He is very particular (he is a constructive set theorist, which explains a lot) and asks his students to make him a three-layer cake that fits under a hollow glass cone he has on his desk. (The cone was given to him as a prize for proving an obscure theorem long ago.) He requires that the cake fill up the maximum amount of volume under the cone as possible and that the layers of the cake have straight vertical sides. (Again, the guy’s particular.) What are the thicknesses of the three layers of the cake in terms of the height of the glass cone? 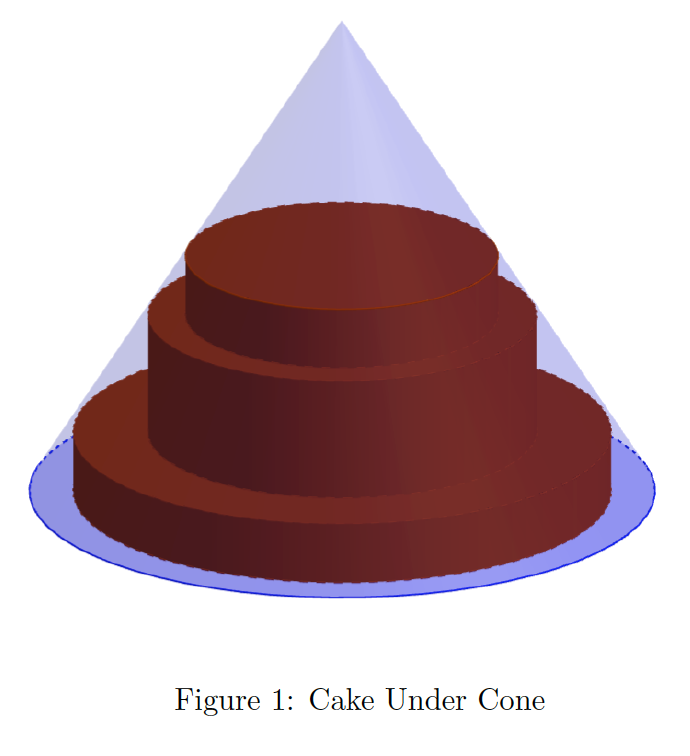 What percentage of the cone’s volume does the cake fill? Extra credit: What if he had asked for an N-layer cake? Need a hint? You can try asking me nicely. Want to submit a new puzzle or problem? Email me. I’m especially on the hunt for Riddler Express problems — bite-size puzzles that don’t take quite as much time or computational power to solve. And here’s the solution to last week’s Riddler, concerning a race between you and an angry ram. It turns out this particular ram has a golden fleece. If you and the ram begin at different, southern corners of a square paddock and you race to escape at the northern corner nearest to you while the ram chases, always heading directly at you, the ram will catch you only if it’s at least 1.618 times as fast as you — the golden ratio! You can solve the problem with some fancy, elegant calculus, like Erik Rantapaa did here or Laurent Lessard and Hector Pefo did here. 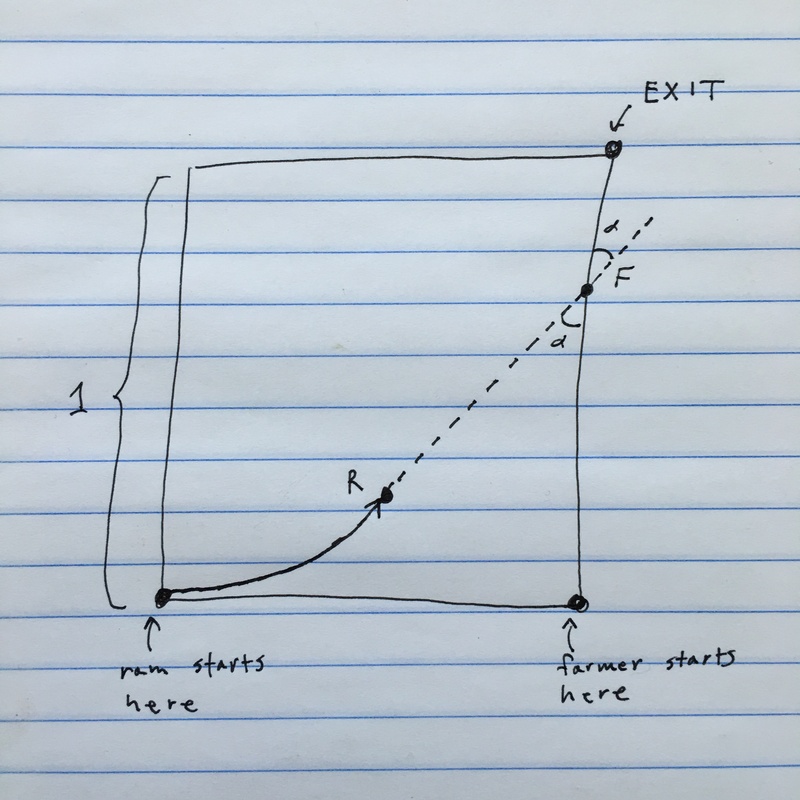 The ram’s path is not a straight line or a parabola or part of a circle — rather, it’s a pursuit curve. Both Nat Guy and Pierre Amoros cooked up interactive simulations of the race. But I liked this calculus-free approach, adapted from Dmytro Taranovsky. Suppose we fix the speed of the farmer at 1 and a side of the square pen at length 1. The speed we’re looking for, the speed of a ram that catches the farmer just as he reaches the exit, is \(V\). Let’s solve for \(V\). At any given point in the race, the ram’s speed in the northerly direction is \(V\) times the farmer’s speed in the direction away from the ram. That’s because the ram moves at \(V\) times the speed of the farmer and the angle between the direction of the ram and north is equal to the angle between the direction of the farmer and the direction away from the ram (as my lovely drawing above shows). But the 🏆 Coolest Riddler Extension Award 🏆 award goes to Lex K., who animated the angry ram’s behavior in the face of a stream of farmers escaping one by one.